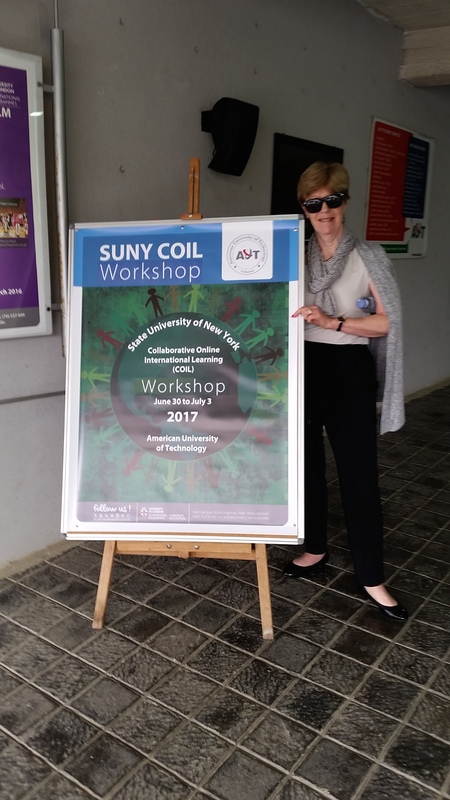 RCC Professor Catherine Roche at the COIL Academy Workshop, held in Byblos, Lebanon in early July. PRESS RELEASE–Without a passport or a plane ticket, some Rockland Community College students will engage in international dialogue this fall. Participants in a class taught by RCC Professor Catherine Roche will work cooperatively online on class assignments with students from a university in Morocco. This special opportunity is a part of a State University of New York program known as COIL (Collaborative Online International Learning). Roche is one of 15 professors from around the SUNY system selected to take part in this exchange with universities in the Middle East region for the fall semester. In preparation for this fall, Roche went through eight weeks of online training and attended the COIL Academy workshop, held in Byblos, Lebanon, from June 30 to July 3. After completing the workshop, Roche traveled to Morocco to visit Mohammed I University, one of that country’s most-prestigious colleges and the school where her partner in the COIL exchange works. Besides touring the campus and the surrounding area, Roche worked with Professor Mohammed Guamguami to finalize their fall course plans. She was also invited to speak to his students, and gave an address at the college on intercultural communication, which she called an enlightening experience. “Students in Morocco are very curious about the United States,” Roche says. “They have a certain image and stereotypes that they see through the media.” After some initial reticence, the students had many questions for Roche following her lecture, and a number of them also asked to take photos with her. None of the students who attended Roche’s speech have ever visited the United States, but most of them indicated they would like to do so in the future. For now, some of those students will get a chance to learn about Americans through the COIL program. Students in Roche’s Principles of Management business course will be teamed up with Moroccan counterparts on projects related to how culture influences communication. The students will communicate through Facebook groups and use e-Portfolios to complete their assignments. Despite the five-hour time difference between Rockland County and Oujda, Morocco, Roche also aims to arrange at least one face-to-face meeting through Skype. The international projects will be worth 25% of the final grade for both the RCC and Mohammed I students, giving each group equal incentive to participate. RCC’s fall semester begins on September 1. Prospective students may still apply for admission; visit www.sunyrockland.edu/go/apply for details. For information on the varied degree and certificate programs offered through RCC’s Business department, visit www.sunyrockland.edu/go/business.